The Katania is a classic Burger, and one of the most beautiful in the world. Built as one of America's first aluminum superyachts, for many years she was owned by one of South America's leading industrialists. 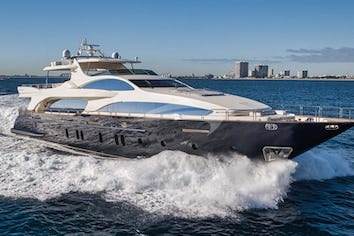 In 1991, he commissioned the famed American yacht designer, Jack Hargrave, to extend and completely refit the vessel with all new, more powerful systems. The result is a vessel with unique eye-catching lines, that draws attention in every port she enters. In 1999, CEO Expeditions purchased her, and completed a meticulous classic interior refit to match her external elegance. To explore these beautiful islands there is no better yacht than the Katania. She is a true expedition vessel, with more facilities than most, and is equipped with true ocean going capabilities. And with 1000 horsepower engines, she is fast enough to cover a greater area so you can enjoy more of the area's unique beauty. Because of her shallow draft and powerful engines she can handle the ripping tides and river currents to explore where cruise ships can’t go. To further enhance your experience aboard one of our yachts, enjoy culinary masterpieces prepared just for you by our master chef. Using the freshest ingredients available, we will create mouth watering specialties, even cooking your day’s catch upon request. Accompanying your meals you will sample wines from the owner’s own personal collection, one of the finest private cellars in the Northwest. Accommodations aboard the Katania are nothing less than the finest. The boat's interior is exquisitely appointed—each stateroom comfortably furnished and shared spaces are designed to provide a luxurious first class experience. For your enjoyment, the stereo system allows you to fill the boat with music, or control its reach room by room. Individual cabins are also equipped with their own CD/stereo player and television. Please enjoy our exceptional library of music, movies, videos and booksThe boat's interior is exquisitely appointed—each stateroom comfortably furnished and shared spaces are designed to provide a luxurious first class experience. For your enjoyment, the stereo system allows you to fill the boat with music, or control its reach room by room. Individual cabins are also equipped with their own CD/stereo player and television. Please enjoy our exceptional library of music, movies, videos and books. Katania has 3+ staterooms, and in addition to a full-width master suite, the two double staterooms feature a double bed and also have a Pullman for that extra guest. And the children will love Kamp Katania – a cozy room with two bunks where they can sleep, play, or watch a movie on the television. You’ll also find the layout of the Katania gives you plenty of private spaces. 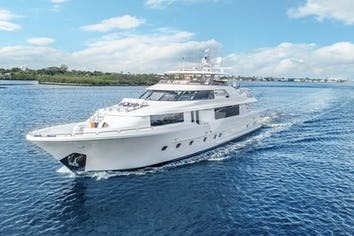 Three separate dining areas are available – so in addition to the formal dining area, guests can dine on the upper deck, or in the comfortable enclosed aft deck/sunroom. Sit on the upper deck with a good book and enjoy the gorgeous vista’s around you, or sit in the warm sunroom while relaxing with a deck of cards or game from our on board game selection. And, after a day of exploring, you might want to relax in the hot tub while enjoying a drink served by your stewardess. 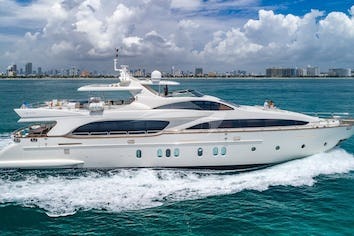 With a crew of four dedicated to your needs, you will truly feel pampered. KATANIA can accommodate 6 guests in 3 cabins. The Master cabin has a queen size bed, shower and toilet. A Guest cabin has a double bed, a single bed, shower and toilet. A Guest cabin has two twin beds, shower and toilet. An extra overflow room "Kamp Katania" does have two twins but no bathroom facilities. KATANIA has air conditioning in the saloon. Crew has a separate heads and shower.